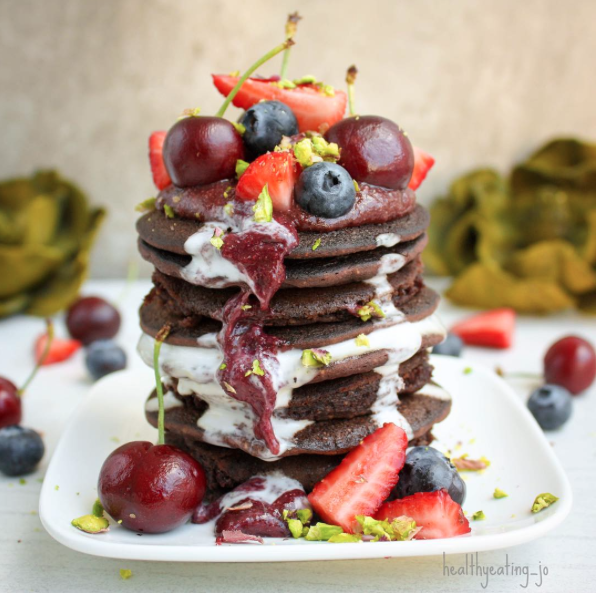 Chocolate and cherries are a perfect match for dessert, or in this case for dessert-for-breakfast! This delicious recipe by the wonderful Healthy Eating Jo is vegan and sugarfree, so even though it feels like you’re having sweets for breakfast, it’s actually a healthy start! 1. Blitz chia seeds for a second to form a rough powder. 2. Add cherries and Natvia and blitz again. Let it sit while you make your pancakes. Done! 2. Cook in some coconut oil over medium heat. 3. To finish, layer pancakes with chia jam, top with fresh fruit and coconut cream. Tips: The bicarb soda and apple cider vinegar make the pancakes light and fluffy, however you can leave it out if you want.